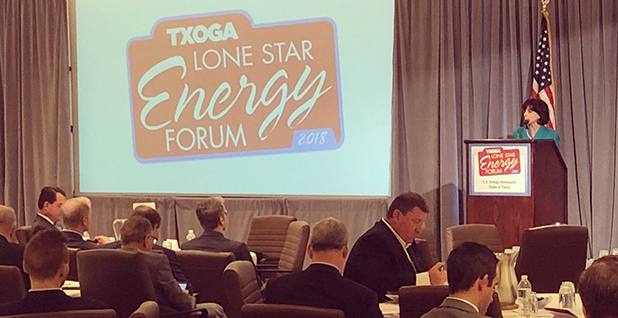 Texas' top oil and gas regulator is cruising to a re-election win next week despite looming questions surrounding her ties to the energy companies she oversees. Christi Craddick, the Republican chairwoman of the Texas Railroad Commission, is seeking a second six-year term against Democrat Roman McAllen, a first-time candidate short of funds. If Craddick clinches the seat, she'll continue to helm one of the most powerful regulatory agencies in the state that's been dogged for years by ethical questions. The case is unusual even in Texas, where voters tend to overlook entanglements that might not pass muster in other states. 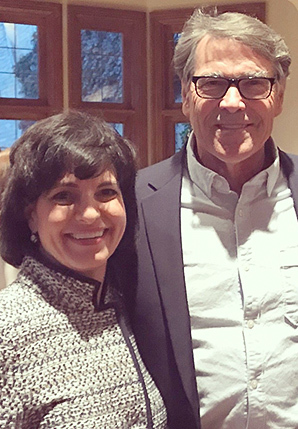 Craddick and her father, Tom Craddick, a powerful Republican state legislator, have long-standing business relationships with oil companies. And Christi Craddick has voted in several cases before the commission that affected either her or her father's interests, according to news reports by the Austin American-Statesman and Austin TV station KXAN. Although those reports don't appear to have dented Craddick's chances at re-election, much of her business involvement with the oil industry wouldn't be allowed in other states like Oklahoma and Georgia that have rules aimed at preventing conflicts of interest. Reports of Craddick's industry ties have also surfaced amid growing bipartisan concern in the Lone Star State about political ethics in general. Rafael Anchia, a Democratic state representative from Dallas who's active on energy issues, said the mere appearance of a conflict of interest undermines the public's trust in both the Texas Railroad Commission and the energy industry broadly. "It hurts the industry when there's a perception that the regulator is not legitimate," said Anchia. While Craddick declined a request from E&E News for an interview, a spokeswoman rejected any assertions of ethical missteps and said the chairwoman has followed state ethics guidelines. "Chairman Craddick's consistent voting record shows she treats every case equally, basing her decisions solely on the facts," Lauren Spreen, a spokeswoman for Craddick, wrote in an email. "Any suggestion to the contrary is entirely without merit, unconfirmed by her voting record, and unreflective of her integrity." McAllen in an interview said voters have been receptive when he's talked about Craddick's involvement in the oil industry. He also said he recognized his bid for the chairmanship is a long shot, in part because he simply doesn't have the funds to get his message out statewide. Craddick had $1.3 million in cash in her campaign account this week, roughly 1,000 times more than McAllen. "To me it's alarming — it shows disrespect for the office," he said of Craddick's business ties. But, he said, "she's outspending me 1,000-to-1." The Railroad Commission, which is overseen by three commissioners elected statewide, is an unusually powerful agency because it regulates the oil, gas and pipeline industries in the biggest energy-producing state. That's made the commission a hot spot for politicians looking to run for higher office, and state law allows the commissioners to collect campaign contributions from the companies they regulate. Most of the commission's day-to-day work is handled by its 750 staffers, who process drilling permits, inspect oil and gas wells, and handle enforcement complaints. The three elected commissioners — all of whom have been Republicans since 1995 — act as both policymakers and a kind of appeals court because they have final say over decisions made by the staff. The other two Republican commissioners — Wayne Christian and Ryan Sitton — both have some interests in the oil and gas industry, but far smaller than the Craddicks. Both men own stock in oil and gas companies, according to their financial disclosures. Sitton also founded a consulting firm whose clients include major oil companies; he placed the company in a blind trust in 2014. Since the advent of the fracking boom a dozen or so years ago, the commission has been at the center of a string of regulatory battles about the chemicals used in hydraulic fracturing, how to regulate drilling in urban areas and whether oil field waste disposal triggers earthquakes. Craddick, 48, has led the commission since 2012. An attorney who holds undergraduate and law degrees from the University of Texas, Craddick worked as a lobbyist and an aide to her father before winning a spot on the commission six years ago in her first run for office. In her first term, she's been an unabashed supporter of the industry. When oil prices fell in 2014 and 2015, she proposed a series of steps to make it easier for companies to keep producing oil from low-output "stripper" wells (Energywire, Aug. 26, 2016). It's hard to know how much Craddick or other Texas officials earn from their business interests because Texas law only requires state officials to disclose broad ranges of income — $500 to $4,999, for instance, or $5,000 to $9,999. Anything over $25,000 is lumped into a single category. Craddick's financial disclosure form shows she has lease agreements or other arrangements with six oil and gas producers, making her a passive partner in the production. She's also involved in a family partnership, Craddick Partners Ltd., and a limited liability company, CL Craddick LLC. All told, Craddick earned at least $82,000 a year from her oil and gas interests and family businesses, according to her financial disclosure form. She owns stock worth at least $50,000 in 14 oil production and pipeline companies. Tom Craddick, a Republican from Midland, is the longest-serving state representative and a former speaker of the Texas House. Texas Monthly magazine once described him as "one of the more successful independent oilmen and real estate investors in Midland." That was in 2005, before the fracking boom breathed new life into Midland and the surrounding Permian Basin oil fields. Back then, his financial disclosure statement was 21 pages. This year, the form was more than four times as long. Tom Craddick, who did not return calls seeking comment, has mineral leases with about two dozen oil and gas producers, the disclosure form shows, along with an interest in Craddick Partners and other family businesses. He brought in at least $280,000 from those businesses, the form shows, although it's hard to gauge his true income. Some of Christi Craddick's votes at the Railroad Commission appear to at least skirt the agency's own rules, according to the American-Statesman and KXAN. The commissioners are required to publicly announce whether they have a "personal or private interest" in a matter that's on their voting agenda and recuse themselves from the vote. One vote in January saved Craddick about $40 a month by allowing a company to flare natural gas from an oil well, the American-Statesman reported. Without the permit, the drilling company would've had to slow or shut down its oil production while it waited for a natural gas pipeline to be built. All three commissioners voted to approve the permit, which was also recommended by the staff. She also voted in 2017 on tax breaks for Kinder Morgan Inc.'s Sacroc field in Scurry County, KXAN reported. Although it's not clear whether Craddick personally benefited from the vote, she owns mineral rights in the Sacroc field and earns between $10,000 and $24,999 a year from her lease with Kinder Morgan, records show. KXAN found more than 400 instances where Craddick voted on matters involving oil wells or companies that either she or her father has an interest in. Craddick didn't recuse herself from any of those votes, the station reported. Nor has she recused herself from voting on companies that she owns stock in. Through the first nine months of this year, she voted on permits and other issues related to those companies at every meeting, according to E&E News research. Craddick's spokeswoman said the chairwoman's oil industry income doesn't create a conflict of interest with her official duties and that she over-reports her business interests. Craddick isn't required to skip votes because of the way her interests are structured. She owns royalty interests in oil and gas property, meaning she gets a share of the income from any production but doesn't have any decisionmaking authority, Spreen wrote. And Craddick is only a minority owner in the family partnership, which is controlled by her parents, Spreen added. Still, those types of investments wouldn't be allowed in some other states that also elect their regulators. The Oklahoma Corporation Commission, which oversees the Sooner State's oil industry, prohibits most ties between its elected commissioners and the companies they oversee, including mineral leases and stock ownership. The commissioners, who are elected statewide like those in Texas, also can't accept anything of value, not even a cup of coffee, agency spokesman Matt Skinner said. Georgia, which elects the members of its Public Service Commission, doesn't allow the regulators to have any business contact with the companies they oversee, including stock ownership. The state hasn't had to address the type of passive investments that Craddick has through her oil and gas leases, said Stefan Ritter, the head of Georgia's ethics committee, but "informally, I think that would not be permitted." In Texas, legislators and watchdog groups spent the last decade pushing for more transparency at the Railroad Commission. A state auditor's report in 2007 found that the commission's inspectors frequently took gift baskets, ball caps and other small items from oil and gas companies, "which may create a public perception that the employee is not objective." In 2013, legislative staffers said during a periodic "sunset" review that the commissioners should avoid accepting contributions from companies that have cases in front of them. That recommendation wasn't adopted in 2013 or 2017 when lawmakers voted to reauthorize the commission (Energywire, May 19, 2017). Watchdog groups have frequently said there's a link between the commission's loose ethical standards and its lax enforcement of environmental and safety regulations. A legislative review in 2017 found that the commission had a hard time even counting how many violations its safety inspectors found. "We don't think the industry is regulated effectively in Texas," said Adrian Shelley, executive director of Public Citizen Texas. "These sort of apparent conflicts that are present and unaddressed would seem to contribute to that problem and to the general erosion of confidence in the agency." Legislators from both parties tried to pass bills last year aimed at shoring up governmental ethics in Texas. None of them passed, even though Gov. Greg Abbott (R) declared ethics an emergency item at the beginning of the session. State Rep. Chris Turner, a Democrat from Arlington, has filed a bill in the past two legislative sessions to clarify the state's financial disclosure forms. That language would require officeholders to disclose more of their income. The top category would be income over $5 million, and the state ethics commission would have to post the disclosure forms online. Turner said the current system, with its maximum disclosure of $25,000, doesn't give the public a clear financial picture of its representatives in office. "I just think that our financial disclosure statements could paint a more accurate picture in terms of what officeholders' financial interests are and provide greater transparency," Turner said. Correction: Rafael Anchia, a Democratic state representative from Dallas, no longer serves on the Texas House Energy Resources Committee. A previous version of this story inaccurately said that he is currently on the committee.